A woman in Marana says her daughter's KIA Sorento burst into flames. She claims the corporation is not taking responsibility for what happened. 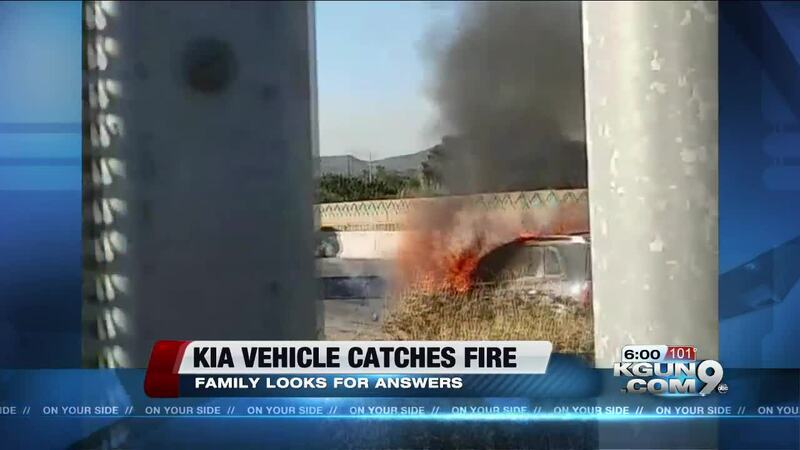 A nationwide investigation into the number of KIA vehicles burning up is also happening here in Southern Arizona. "My granddaughters were crying, my daughter had this fear, the smell was awful, the melted everything," Tina Chavez said as she described what she believes is one of the scariest moments in her life. In September last year, her daughter and her boyfriend were driving their three kids to daycare. They were taking the Prince Road exit on I-10 when her 2012 KIA Sorento suddenly turned off. "She heard a loud pop and her car was almost instantaneously engulfed in flames," Chavez said. Luckily everyone was able to get out safely, but KIA has not accepted responsibility for the incident. Chavez' family has not heard from them since November. "The last time we talked to them, they just said that at that time there was nothing they were going to be able to do for them," Chavez explained. Hundreds of KIA drivers around the country have filed similar reports with the National Highway Transportation Safety Administration. Two KIA models stand out, the 2011 to 2014 Optimas and Sorentos, which were already under an engine defect recall. According to Chavez, her daughter's Sorento was also recalled. Her daughter took the car back to the KIA dealership and the engine was replaced, but the car caught fire within seven days of replacing the engine, Chavez said. Now, Chavez says her daughter is out thousands of dollars. and many attorneys do not want to get involved with big corporations. Nearly a year later, she simply wants KIA to take full responsibility. "We ask them to just to even help her get in a vehicle, we would just make the payments on it, she just needs a vehicle to drive in," Chavez said. KGUN9 spoke with KIA a representative about this specific incident, but we have not received a response yet. "Kia Motors America (KMA) works directly with customers and will provide inspection results directly to those customers. If it is determined that a fire is the result of a manufacturing-related issue, KMA will work with customers to address any costs or expenses they may incur."